3¢ deep violet, pink back variety, o.g., never hinged, beautifully balanced margins and exceptional centering, rich bright color, Extremely Fine to Superb, a wonderful gem example of this scarce variety; with 1996 P.F. & 2004 P.S.E. certificates, the latter Graded (XF-Sup 95, SMQ $325 for normal 426). 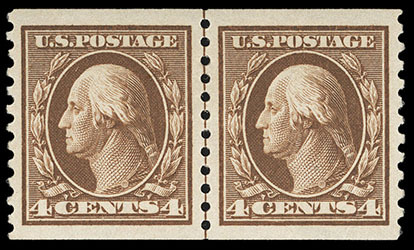 1914, 4¢ brown, o.g., never hinged, exceptionally centered amid uncommonly wide margins, rich deep color, an Extremely Fine to Superb jumbo, one of five examples to obtain this grade with ten examples grading higher; with 2000 & 2004 P.S.E. certificates, the latter Graded (XF-Sup 95J, SMQ $900). 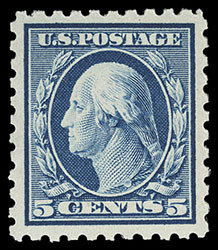 1914, 5¢ blue, o.g., never hinged, rich deep color on bright paper, precise centering with large even margins around, Extremely Fine to Superb, an exceptional gem; with 1997 P.F. & 2004 P.S.E. certificates, the latter Graded (XF-Sup 95, SMQ $600). 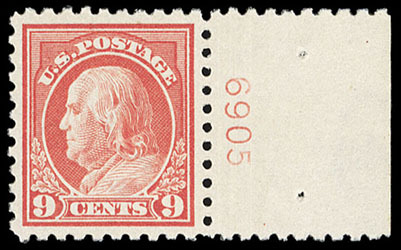 1914, 9¢ salmon red, right margin plate number "6905" single, o.g., never hinged, exceedingly well centered amid nicely balanced margins, brilliant color, Extremely Fine and choice. 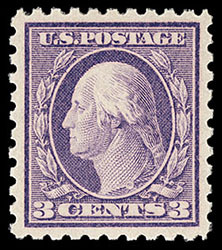 1915, 50¢ violet, o.g., never hinged, strong vivid color on bright paper, large margins and choice centering, Very Fine and choice; with 2002 P.S.E. certificate. 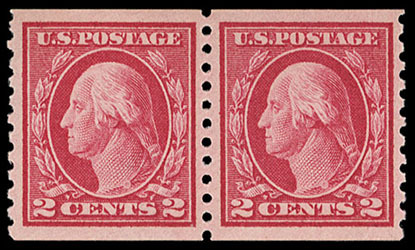 1914, 2¢ carmine, horizontal flat plate coil, pair, o.g., never hinged, choice centering amid wide margins, radiant color and pristine freshness, Extremely Fine, an eye-arresting pair; with 2018 P.F. 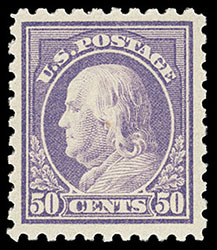 certificate Graded (XF 90, SMQ $525). 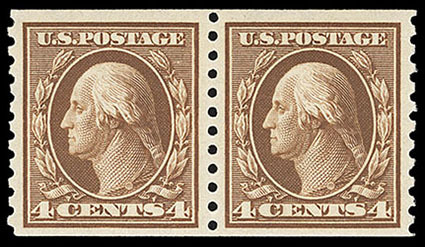 1914, 4¢ brown, horizontal flat plate coil, pair, o.g., never hinged, wide margins, rich color and very fresh, Very Fine; with 1991 and 2001 P.F. certificates. 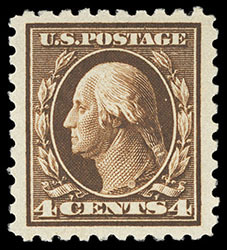 1914, 4¢ brown, horizontal flat plate coil, guide line pair, o.g., lightly hinged, exceptionally centered within wide margins, rich deep color and very fresh, an Extremely Fine gem; with 1996 P.S.E. certificate. 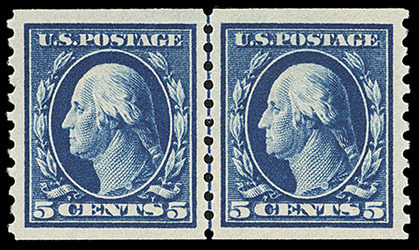 1914, 5¢ blue, horizontal flat plate coil, pair, o.g., lightly hinged, beautifully centered amid wide margins, deep intense color, Extremely Fine and choice, a striking pair; with 2002 P.F. certificate. 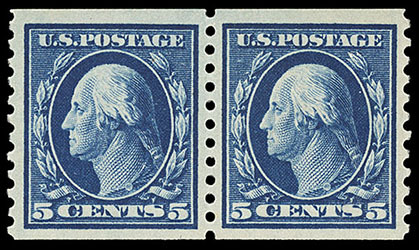 1914, 5¢ blue, horizontal flat plate coil, guide line pair, o.g., very lightly hinged, exceptional centering within wide margins, rich deep color on bright fresh paper, an Extremely Fine gem, a beautiful line pair; with 1988 P.F. certificate.